Over 6 hundred scientific studies, performed independently around the world, have documented the remarkable benefits of this experience. Greater intelligence, superior brain wave functioning, improved concentration, comprehension and memory, increased learning ability and speed in solving problems, heightened academic performance, improved moral reasoning, enhanced mind body co-ordination and athletic performance, improved health, reversal of aging, decreased stress and anxiety, and the growth of ideal social-behaviour but a few of the findings reported in major scientific journals. And so, having gained these benefits from completing his TM practice in the morning, our student begins his first CBSE subject of the day. As he assembles the points of knowledge required to solve the Maths, Computer, or Language problems posed by his teacher, a remarkable process begins. His mind begins to draw upon the Cosmic Intelligence accessed during his meditation and he achieves his first breakthrough in problem solving ability. This integration of human and Cosmic Intelligence intensifies as he advances through each standard. Physical education promotes fitness, cooperation, sportsmanship and school spirit. 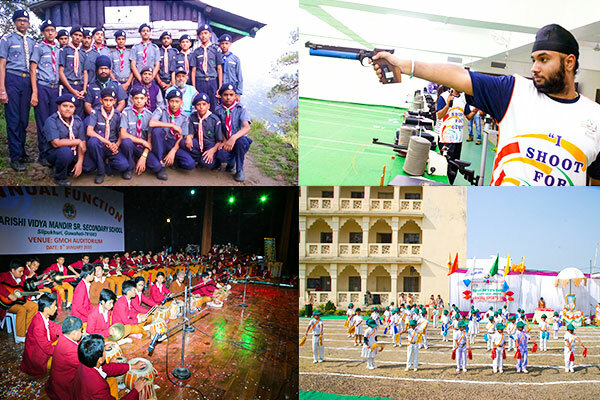 Maharishi Vidya Mandir® Schools generally have large play fields where many popular sports like cricket, volleyball, hockey, foot-ball and tennis are played under the guidance and supervision of qualified physical education teachers. Apart from these Indoor games like carom, table tennis and chess are also pursued with equal fervour. MVMs provide state-of-the-art facilities for speedy and all-round development of students, which include a well-stocked senior and junior library with an array of periodicals, journals and manuals. The Physics, Chemistry, Biology, Mathematics and Composite Science laboratories are spacious and well equipped. The qualified doctors conduct students’ medical check-up as and when necessary. In order to help our student integrate this new synergy, Maharishi has designed special charts that present the lessons of each subject in terms of the whole discipline and in terms of the student's own experience of Self. Furthermore, our student attends one period devoted to Sanskrit and Vedic Science to ensure that, commensurate with his own level of psycho physiological development, he has a perfect understanding and appreciation of this transformation. As the days, months, and years of his study progress, our student becomes eminently versed in each modern discipline. At the same time, the unbounded nature of cosmic intelligence becomes fully integrated into his mind and body, and he begins to breath the totality of Natural Law. In this mature state, his mind swings with the same infinite intelligence that governs the entire universe without mistake, from the galactic orbit of heavenly bodies to the minute detail of subatomic particles. And our student can bring this universal intelligence to bear upon any subject of his choosing.